This house at 3434 Heidelberg is up for auction. Update: None of the properties sold in the auction. 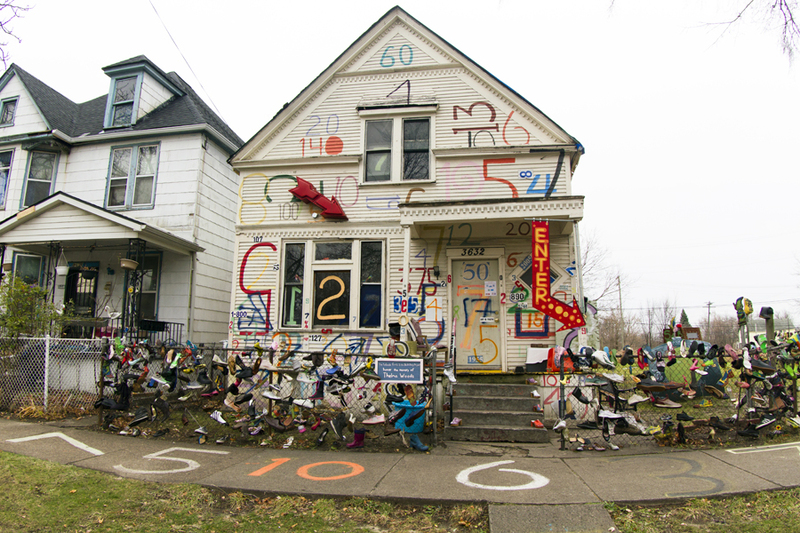 A tax-foreclosure auction for three world-famous Heidelberg Project properties on Detroit’s east side ends this afternoon. The Wayne County tax auction ends on the properties at 4:30 p.m.
Bidding began Thursday on two art-festooned houses and a vacant lot, which are not owned by the nonprofit but have been integral to the project for years. The iconic Number House was left vacant after the owner, Thelma Woods, died several years ago. 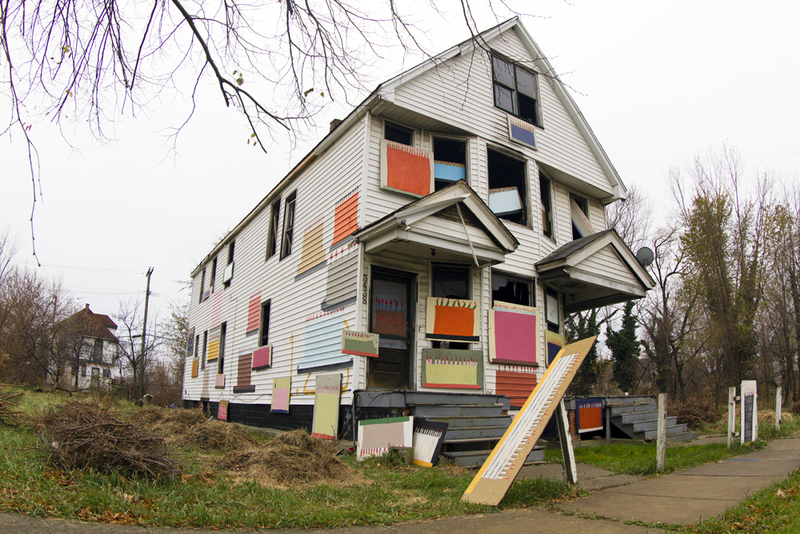 Taxes haven’t been paid at the 3632 Heidelberg St. property since 2007, county records show. The minimum bid is $7,400 to cover the costs of delinquent taxes. If the house doesn’t fetch a bid, it will be auctioned again, starting at just $500, like the other two properties. Also up for auction is a vacant lot just east of the Number House at 3616 Heidelberg, where installations are erected across the lawn. The minimum bid is $2,500. The owner, Howard Lewis died, and hadn’t paid taxes since 2006, according to county records. The third property, which is a block east at 3434 Heidelberg, is a house adorned with paintings of birthday cakes. The owner, S.K. Davis, owes $21,169 in taxes and late fees. It’s unlikely to sell in the first round because the minimum bid is $21,700. The sale of the properties puts the project in a precarious position. Since 2007, Wayne County seized in a tax foreclosure eight of the nonprofit’s properties, including its signature Party Animal House, which was intentionally destroyed by a fire on March 7. The nonprofit currently owns just four of the properties – all vacant land – in the two-block area. The Heidelberg Project also was hammered by a string of arsons late last year and has been using a smaller portion of its budget on maintaining property in the outdoor installation park. Losing the three properties could break up significant sections of the project. The three properties are among more than 23,000 in Detroit that ended up in the Wayne County Tax Auction this year. Check out this map of every tax foreclosed property in Detroit. You had a good run, Heidelberg. Maybe if the people running it weren’t insane, they could have used some of the money raised to buy and insure the other properties. Instead someone got not that rich.